Perspectives, thoughts and comments by CaliforniaSolar staff and others regarding solar developments in the state. Should the Solar Tariff Delay Your PV Plans? Do We Need a Search For More Oil? Exclusive insight and opinion from solar industry experts and thought leaders on solar developments in California. 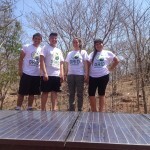 Guest contributors are not affiliated with California Solar. 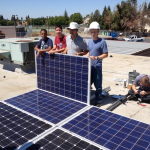 Laguna Creek High School in Elk Grove, California (suburban Sacramento) has created a Green Energy Technology Academy (GETA) that allows students in all years to participate in a variety of special Solar projects. These range from projects that benefit the school to solar projects that have provided benefits in 23 foreign countries to projects that have won the team international recognition. I am pleased to welcome CaliforniaSolar. A variety of individuals from diverse backgrounds and reflecting a wide range of viewpoints follow the solar industry within and beyond California. We often find viewpoints that are well-reasoned and/or raise important points for consideration. The following have particularly caught our eye. If you have seen one not listed that you believe should be brought to a wider audience through this page, please let us know about it through our Contact Us page. California will require solar panels on all new homes. That’s not necessarily a good thing. California keeps breaking solar records. How long before it’s a problem?